Live theater is magical because it’s quite literally alive. Nearly every aspect of a show, whether it’s the vocals or a quick costume change, happens in real time. The feats become more impressive on larger stages, especially as the actors and crew are expected to produce stellar performances numerous times a week. They’re responsible for perfect line delivery, flying in large set pieces at just the right interlude, or flashing a light cue when the actor hits their high note. Purchase your tickets to 'Mean Girls' here! When we look deeper into professional theater, specifically Broadway, we’ll find that many of these live theater performances are telling similar stories. Their content contains characters we know and lines we can recognize instantly. Broadway is transforming the movie industry into theater productions, one show at a time. There are benefits to bringing iconic movies like these to Broadway. Tina Fey and everyone at ‘Mean Girls’ has brought in millions of dollars in revenue, selling out multiple shows and continuing to attract a large fan base. I bought my sister tickets for her birthday when I heard it was coming out, before I knew who was in the production or had looked at reviews. We were both fans of the 2004 movie—what did we have to lose? However, there’s more to bringing movies to Broadway than the financial incentive. Theater is notorious for catering to older, wealthy white audiences, but producing well-known movies as Broadway shows brings new fan bases to the theater world. This year, ‘Frozen’ and ‘Spongebob Squarepants’ have attracted families who enjoyed those stories on their screens at home. ‘Mean Girls’ reached young women like my sister and me, who couldn’t wait to see how the iconic lines we’d quoted for years would be worked into the new production. Although the Internet, press, and younger fans have been talking nonstop about these new musicals, there was little praise for them come the 2018 Tony Awards. ‘Mean Girls’ and ‘Spongebob Squarepants’ garnered a massive 12 nominations each, but it was ‘The Band’s Visit’ that nearly swept the awards ceremony, taking an impressive ten wins. ‘Spongebob Squarepants’ won Best Scenic Design of a Musical, while ‘Mean Girls’ and ‘Frozen’ went home empty-handed. The success of ‘The Band’s Visit’ came as a surprise to many; the production garnered much less attention compared to the three other nominees. It’s no coincidence that movie versions of ‘Mean Girls,’ ‘Frozen,’ and ‘Spongebob Squarepants’ grossed 100 million dollars each while the 2007 movie production of ‘The Band’s Visit’ only made 14.6 million. The movie popularity of these shows, not the quality of their theatrical productions, is driving audiences to buy Broadway tickets. What does this mean for the future of Broadway? There’s magic in bringing a movie to the stage, but there’s also limitless comparison and criticism. I felt oddly betrayed when Grey Henson, who plays Damien Rice in ‘Mean Girls,’ rushed through the iconic ‘That’s why her hair’s so big. It’s full of secrets’ line so the next part of the new musical number could begin. There are ways that musicals based on movies can build upon pre-established characters and themes, but it’s impossible to recreate every magical movie moment we loved on the stage, a completely different medium than the screen. The popularity of the movie, not the quality of the theatrical production, is driving audiences to buy Broadway tickets. It’s time to reconsider what stories we want to put on stage before taking a screenplay and making it into a book and lyrics. By running to the money and transforming movie characters and plots we already know, we limit the range and diversity of stories we’re putting into the world. It’s time we start valuing works conceived and written for the stage instead of focusing on adaptations. Imagine how the industry—and theater, as an art form—could change if we do. 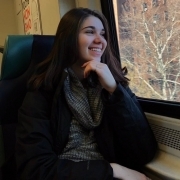 Zoë is a rising junior at Wesleyan University majoring in English with a concentration in Creative Writing. To read more of her writing, please visit www.writersblock.space or The Wesleyan Argus.